Melissa Gifford - Independent Stampin' Up!® Demonstrator: Let's Celebrate You! I am still playing with the Picture Perfect designer paper to build up my stash of birthday cards. This paper is so much fun to play with and really needs little added to it to give it the 'wow' factor. I am loving it on the basic black cardstock as it really makes the images pop. Its a bit hard to see in the photo but I have added a black embossed mat on the base of my card using the Sparkle textured embossing folder. This adds another subtle element and also gave my an anchor for the silky soft Berry Burst metallic edge ribbon as I was able to wrap the ribbon around the layer before adding it to my card. I also added a tiny bit of wink of stella on the flames and scattered a few tutti frutti sequins. These have an adhesive back which is a bit of a game changer for me rather than having to mess around with glue! I cut my candle piece at 3" x 4 3/4" and layered the lemon lime and berry burst layers about 1/8" bigger to give a sliver of extra colour. 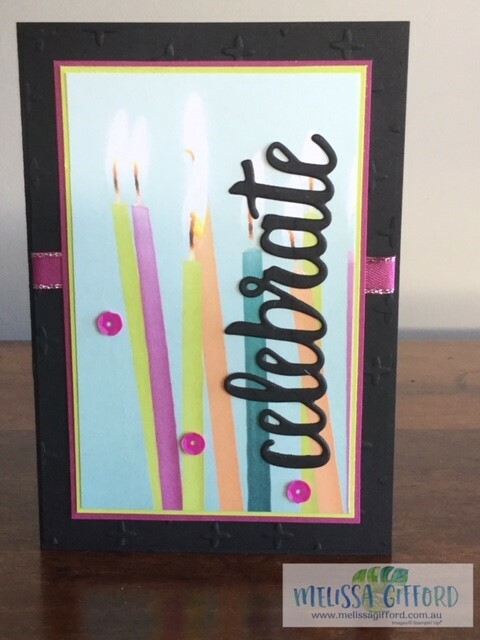 And the die cut is from a sale-a-bration item called Celebrate You thinlit dies which you can earn for FREE with a $180 order. I just love the fonts in this set and it coordinates beautifully with another free sale-a-bration item - Amazing You. By cutting the paper in half I can get 2 cards from each piece of 6x6" paper. So a pack of 48 can make 96 cards - how's that for economical?